Tranquilize and treat yourself with a private canyon-like feel, in a phantasy at the Bamboo Pool. Escape from the stir of the Strip, and luxuriate in a discrete sparkling champagne, by the secluded spacious pool. Designed in a desert-like landscape, the pool emits an exotic effect with mellow music and stimulating spa subsidies. The upscale tropical oasis and desert-like atmosphere creates a hot and powerful, yet cool and relaxing environment for escape from the busy Vegas life. 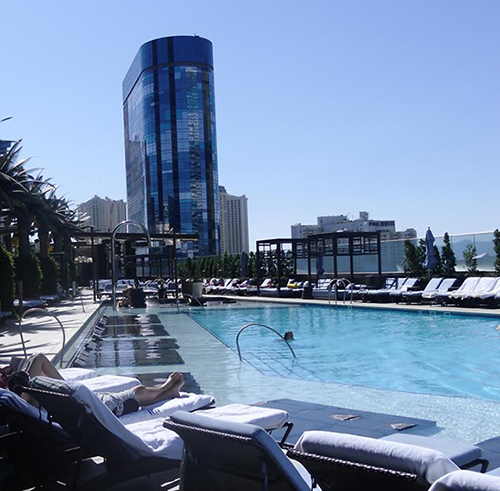 Situated on the 14th floor of the Cosmopolitan Resort & Casino, the Bamboo pool moves beyond the traditional Vegas party pool scene, into an elegant, specious place for ultimate peace and relaxation. The Bamboo pool has its own two bars offering a large variety of iced, refreshing drinks and light meals. To fulfill and even exceed your expectations the Cosmo offers fun cabana misters that keep the summer air-cooled and a small pool shop onsite with last minute essentials that you may have forgotten. There is always low-volume music streaming in the background and oftentimes the pool will be visited by great Dj’s playing chill out lounge tunes. Overall one of the best spots to recharge in Vegas! The Bamboo pool has on average high guest ratings on popular online review platforms such as Yelp.com. Visitors find the Bamboo pool a great place to , relax, swim, drink and most of all unwind after a crazy night out. Additionally reviews show that the Bamboo pool is a lot more quiet and relax than Cosmo’s Boulevard and Marquee Dayclub. To make guests even more comfortable, the pool is situated just across Cosmopolitan Spa and Westside Fitness center. Last but not least Bamboo pool reviewers often praise the staff as very friendly and helpful, while the food and beverage prices are to be expected pricey.